Diagnodent® is a safe fluorescent laser that detects hidden tooth decay accurately, quickly, and in its earliest stages. 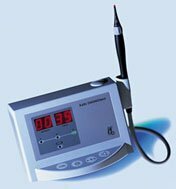 By using Diagnodent® Alpine Dental Center can accurately expose areas of tooth decay without scratching, probing or “opening up the tooth.” This provides a greater chance of identifying, treating and retaining a natural tooth without the need for expensive and time-consuming restorations. If you have any questions about our dental technology please don't hesitate to contact us at our family dental practice in Thornton, CO!